Whether you're logging in the Northwest, working cattle at the base of the Rockies, or heading to a hard day at work in the Midwest, the Chippewa Men's 29408 Leather 10 Inch Black/Bay Lace-Up Boots will have you headed in the right direction with all the performanc ... (see full details) (see specifications) #CHP29408. Whether you're logging in the Northwest, working cattle at the base of the Rockies, or heading to a hard day at work in the Midwest, the Chippewa Men's 29408 Leather 10 Inch Black/Bay Lace-Up Boots will have you headed in the right direction with all the performance features you need for comfort and protection. You'll feel instantly protected once you step into these heavy-duty Chippewa boots, crafted with a combination of black and bay crazy horse leather uppers. Chippewa employs Goodyear leather Welt construction to attach the Vibram Nitrile Yellow Plug outsoles to the rugged leather uppers, so these men's boots are fully repairable for increased longevity. The outsoles are oil- and slip-resistant for solid footing on any terrain. They work to absorb shock as well, so you'll have less foot fatigue after a long day on your feet. The brown and black boots feature triple-ribbed steel shanks. These give your arches some much-needed reinforcement for those tiresome hours at work. For even more support, there are 4 iron rubber/6 iron robus combination midsoles within the men's footwear. Non-tarnishable brass hardware and heavy duty wax Sta-tied laces keep these packers on your feet securely. Intricate details and the Chippewa logo grace the outsides of this pair of USA-made boots, adding unique style to them. Inside, you'll find them lined with leather which helps maintain their shape. The Texon insoles are cushioned to soften your steps and provide long-wearing, all-day comfort. Lace-up the comfort and protection of Chippewa Men's 29408 Black/Bay Leather USA-Made Boots. No matter what or where your challenge, this pair will keep you ready to meet any and every foot-wise demand you're up against. 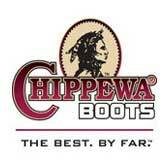 Chippewa offers these features plus the protection of a safety toe in the 29409. I ordered these boots in April of 2015. They were on back order. I spent a lot of time looking at Whites and other custom boots but really liked the looks of these. So I figured I'd wait. Well it took till September of 2015 to finally receive these and I am so glad I was patient. I had contacted Chippewa several times to see how much longer till production would begin and they said not until the right quality of leather was available ( I think they are Horween leather) It impressed me that they would risk losing a order for the quality of their product. I have only had them 3 days and they are getting comfortable already. I have tried red wings 3 times a well made boot but could never get them to feel right. this is my 2nd pair of Chippewas the first are the Loggers that are insulated and these are so good I ordered these for summer work but they look so cool they are now my dress boots/daily wear instead. Send me some money so I can get a summer work boot please. Chippewa Boots: Men's Leather USA-Made 29408 Lace-Up Black/Brown Packer Work Boots is being added to your cart.